Early on Thursday morning, residents of Ilitha Park in Khayelitsha took to the streets to protest against high water bills. Water has recently become a recurring issue in informal settlements as political parties fight for votes in the lead-up to the 8 May elections. With less than a month to go before South Africans head to the polls, multiple protests have erupted around the Western Cape. On Thursday morning, protestors in Ilitha Park in Khayelitsha blockaded roads, resulting in MyCiti and Golden Arrow buses halting operations in the area. The protest was organised by activist group #Mayibuye# and the Water Crisis and High Bills group, led by Bishop Derrick Mtsolo of Litha Methodist Church in Ilitha Park. In a statement issued to other organisations and campaigns in Cape Town, the two groups called on residents to participate in a "Total Shut Down" of the city. 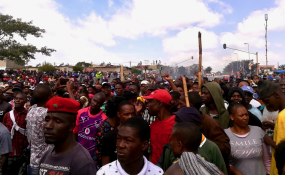 Mtsolo said that the protest was organised in response to issues around the scrapping of high water bills, installation of improperly functioning water meters and residential water being cut off.